Buying and servicing tires for industrial equipment and buying and servicing tires for a passenger vehicle are two different things. We provide top-of-the-line industrial tires from Goodride. Industrial tires are made to support heavy-weight vehicles and maintain reliability and long service life on any surface, from roads to forests. Goodride tires are created to safely hold the weight under a variety of road and weather conditions. As a true front-runner in the industry, Goodride continues to develop environmentally-safe products, meeting the demands of diverse customers. Goodride EDT tires ensure a great ride, uncompromising safety and reliability. These tires have just the right traction and promise a long life. 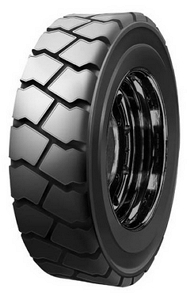 Goodride EDT tires boast superior design for low rolling resistance and great fuel efficiency. Besides, they feature sufficient tread material and casing strength for enhanced retreadability and regroovability. In other words, Goodride’s heavy-duty tires promote cost-per-mile savings. So, if you want to spend less and get more, Goodride is the answer! I've had this set of tires for only 1500 miles, but I already had a chance to test them in light snow and ice. So far, they're living up to expectations, very stable and no sway.